Hi everyone! My name is Calley Ondocsin (pronounced phonetically, on-dock-sin) and I am Hilary’s faux cousin. That’s the best way I know to describe our relationship although I feel like we have always been related. My mother-in-law is great childhood friends with Hilary’s mom and her aunts. She’s just like another aunt to Hilary which makes me her cousin! I believe I have the pleasure of finishing up the guest posts on the blog before Hilary returns from her leave. I am very anxious for her return to get updates on baby Natalie and also to hear Hilary’s new perspective on being a mother. 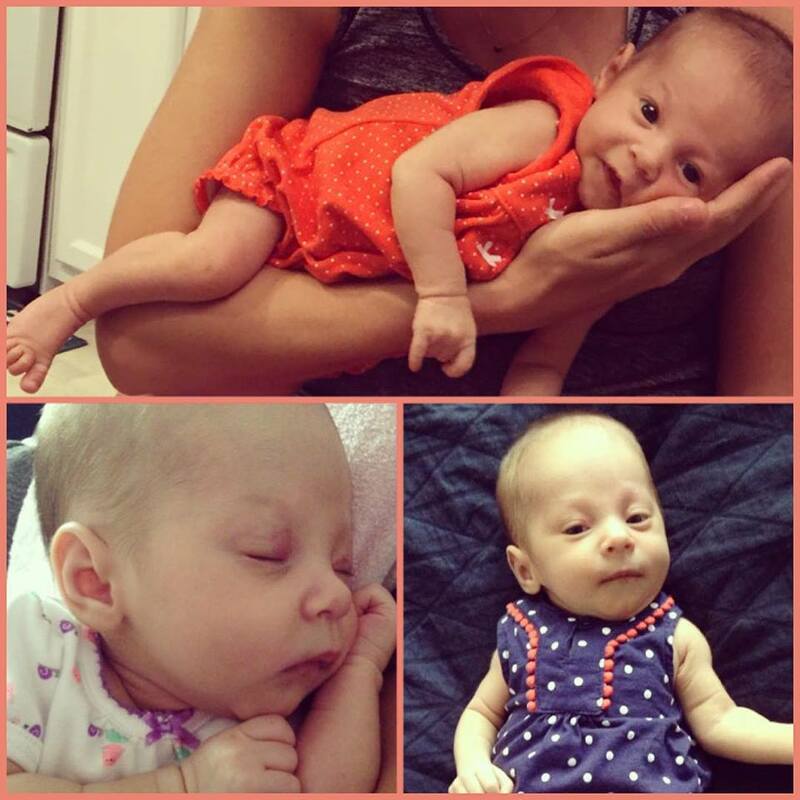 Speaking of Miss Natalie Rose, she is about 6 weeks old and growing too fast! Here’s the latest of the little bean. Too cute! So on to my Mexican Monday. 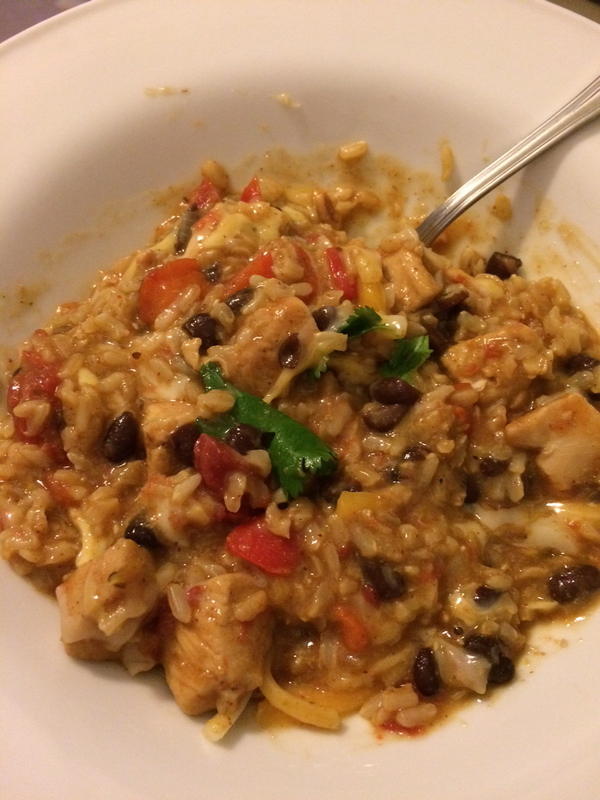 We regularly eat some type of Mexican inspired dish almost on a weekly basis. It’s just so easy to make different variations of tacos, fajitas, quesadillas, salad, and so forth. When you start with the basics of beef/chicken, bell pepper, and onion, you can come up with so many tasty dishes. 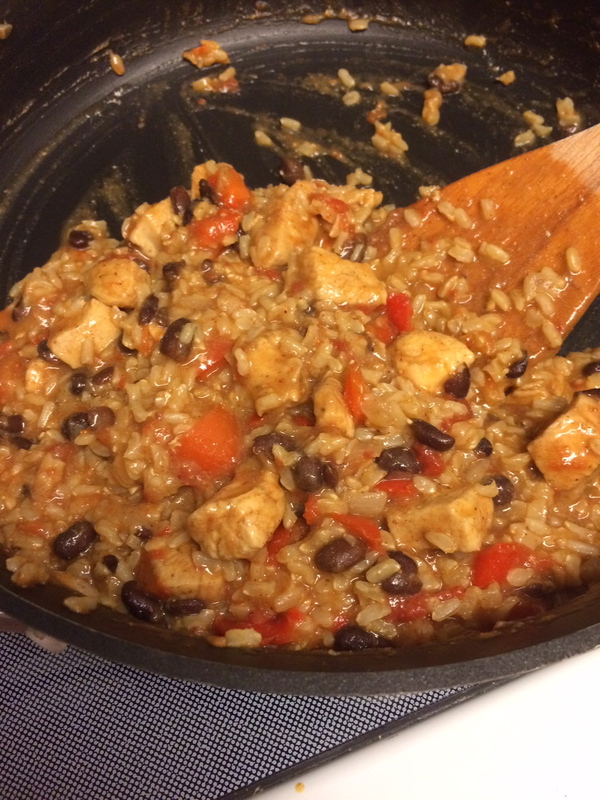 One I’ve recently added to my list is an easy one-pot dish, the chicken burrito bowl. I used a deep dish skillet for this recipe, but I believe a large pot of any kind would work nicley. 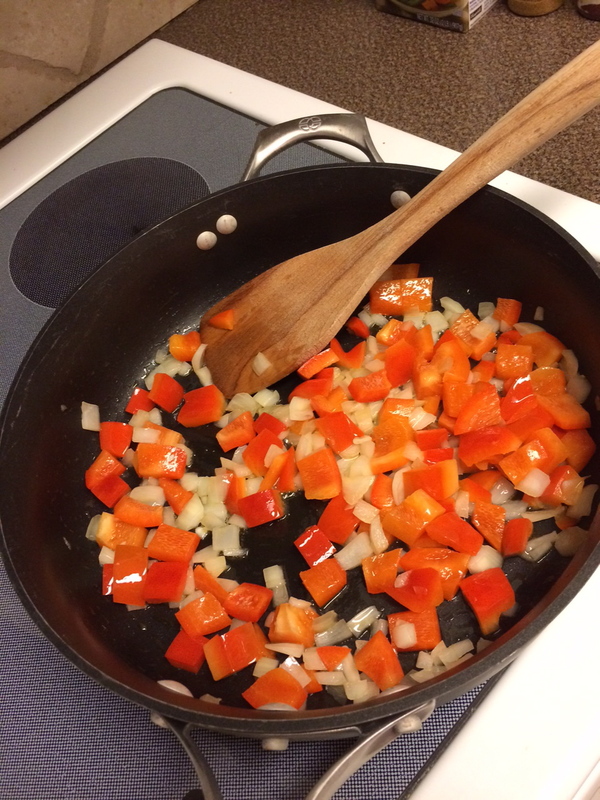 Start by sauteing the diced onion and bell pepper in a little olive oil. I chose to use a red bell pepper instead of green solely because they just looked better than the green that day at the grocery store. Use your favorite color! Saute just until the onion is starting to turn clear. Next, add the diced chicken and cook until no longer pink. It doesn’t necessarily need to be cooked through because it will continue to cook with the rice. Also add the spices at this point to really coat the chicken. Once the chicken is no longer pink, scoot everything in the pan to one side, add a little bit more olive oil and then the rice. You’ll toast the rice for about 1-2 minutes. I’ve heard this helps keep it from getting gooey since it’s cooked in one pan, but I also wonder if it helps with flavor much like toasting nuts. Next add the black beans, Rotel, and chicken broth and stir well. 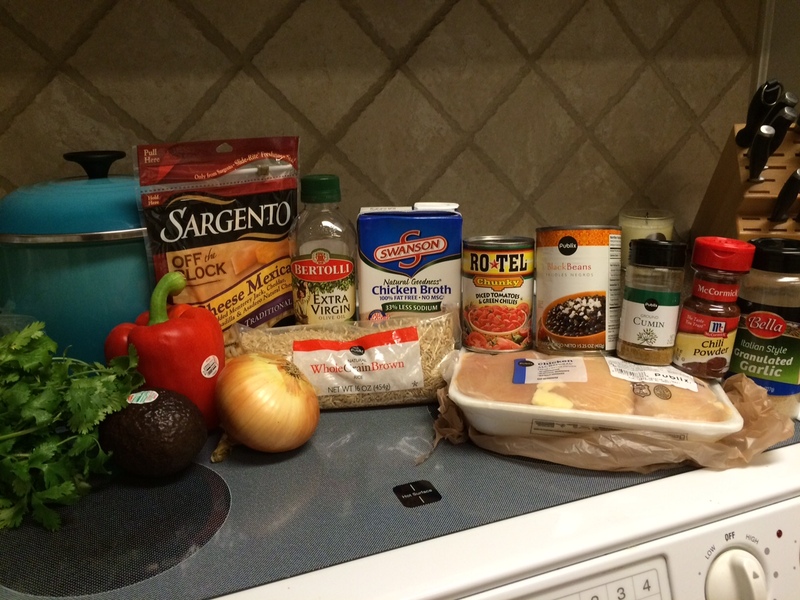 Once I took this picture it occurred to me that this might make an excellent chicken tortilla soup if you left out the rice. I may have to try that out this coming fall. Bring to a boil, then reduce to simmer and cover for about 20-25 minutes. Here’s an important tip. Check the cooking time of your rice! 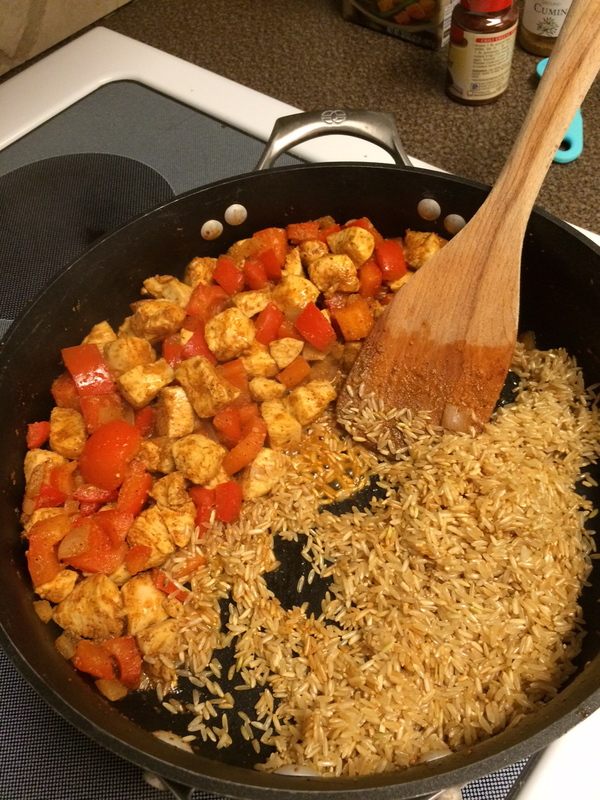 I thought mine would cook in 25 minutes, but when I looked at the rice it called for 45 minutes of simmering. Ooops! Dinner was served much later than expected due to this little mistake, so I’m helping you avoid that. You’ll know it’s ready once the rice is cooked and the liquid is absorbed. This makes great leftovers and would be perfect if you did want to stuff a tortilla with the mixture to make a burrito. I’m willing to bet it tastes just as good and is probably healthier than any burrito at Moe’s, Chipotle, or Qdoba. I like this dish so much because you can truly customize it to your liking. If you want to leave the meat out just add a little more black beans. I’m sure it would taste great adding steak as well. I hope you give this dish a try and enjoy the simplicity of the one-pot meal as much as I do! Saute onion and bell pepper on medium-high heat in 1 Tbsp of olive oil just until onion is starting to turn clear. 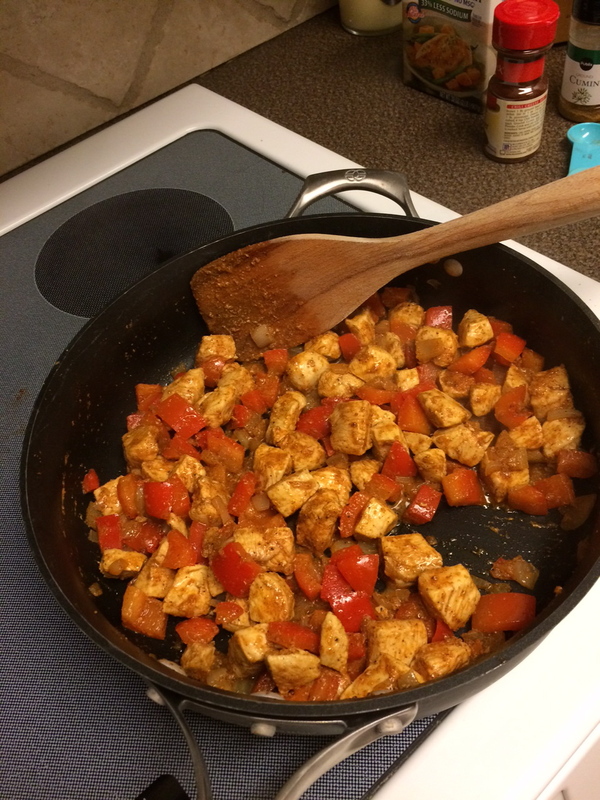 Add the diced chicken and sprinkle in the garlic powder, cumin, and chili powder. Continue to saute until the chicken is no longer pink. Move all ingredients in the pan to one side. Add 1 more Tbsp of olive oil and the rice. Toast the rice for 1-2 minutes. 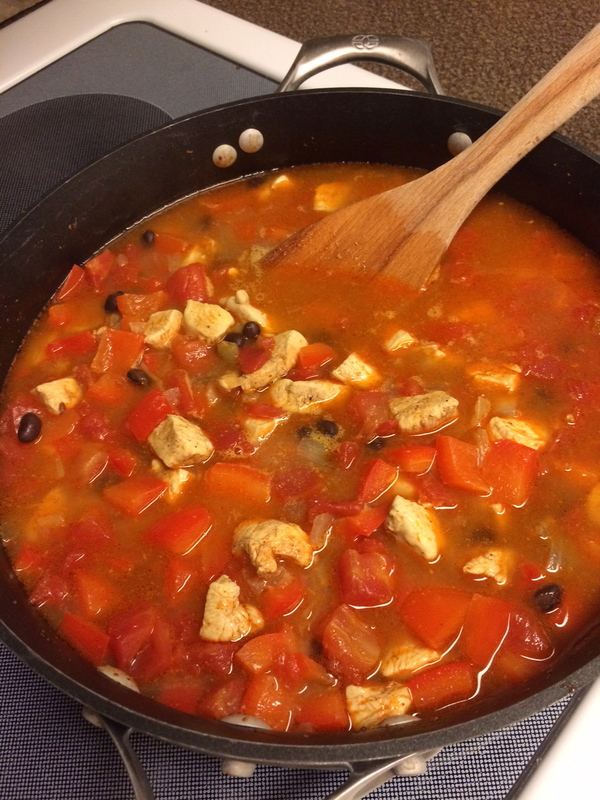 Stir in the chicken broth, black beans, and rotel. Bring to a boil, then reduce to simmer and cover. Cook for about 20-25 minutes or until all the liquid is absorbed and rice is cooked. Garnish with your favorite toppings and enjoy!